Vanity Call Signs: For a listing of the ham call signs from the FCC's database that will be coming available tomorrow for submission on a vanity license request, links to call signs that will be coming available in the future, and for a listing of the ham vanity applications that have been granted by the FCC, and for links to the applications that have alread been filed with the FCC and the status of those applications, click on the "vanity calls" link to the left. For quick links to ham vanity calls that will be coming available and to applications that have already been filed with the fcc, click on the buttons below. The information is sorted and may be viewed by call prefix, district or suffix as indicated below. 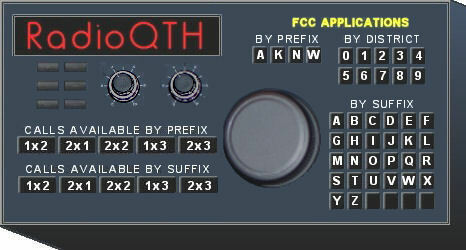 The menu items to the left of this text will take you to the many items available to you on the RadioQTH site. Also notice the quick links in the menu bar at the top of this page, which will take you to some of the more interesting items that might otherwise have been easily overlooked. Question: What determines the upper frequency limit for a computer soundcard-based oscilloscope program?